This article is about the company that commenced operations in April 2006. For the previous operator which also used Southeastern branding, see South Eastern Trains. London & South Eastern Railway Limited, trading as Southeastern, is a British train operating company owned by the Anglo-French joint venture Govia that provides passenger rail services in South East England. It is the key operator of commuter and regional services in South East London and Kent but also serves parts of East Sussex. 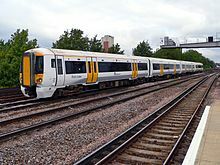 Southeastern trains operate on three main routes: the Southeastern Main Line from London Cannon Street and London Charing Cross to Dover via Sevenoaks; the Chatham Main Line between London Victoria and Dover/Ramsgate via the Medway towns; and High Speed 1 from London St. Pancras. Southeastern began operations on 1 April 2006 as the franchisee for the new Integrated Kent franchise (IKF), replacing the publicly owned South Eastern Trains on the former South Eastern franchise. Southeastern has received a number of extensions since, and the current franchise is due to end on 22 June 2019. Govia has bid to continue operating the new South Eastern franchise from that date. In April 2019, it was announced that Southeastern and the Department for Transport were negotiating a further extension to 10 November 2019 with an optional to extend until April 2020. Southeastern serves the main London stations of Charing Cross, Victoria, Blackfriars, Cannon Street, London Bridge, Waterloo East and St Pancras. The Southeastern network has a route mileage of 540, with 179 stations. About 70% of its services run to and from London. It is owned by Govia, a joint venture between Go-Ahead Group and Keolis, which also operates the neighbouring Southern franchise that overlaps with Southeastern in some areas. The company's formal name, under which it mounted its bid for the franchise, is London and South Eastern Railway (LSER). The managing director is David Statham, who joined the company from First Capital Connect in 2014. In December 2003 the Strategic Rail Authority announced that Danish State Railways/Stagecoach, FirstGroup, Govia and MTR/Sea Containers had been shortlisted to bid for the new Integrated Kent franchise, which would replace the South Eastern franchise and include services on High Speed 1 operating from St Pancras. In November 2005 the Department for Transport (DfT) announced Govia had been awarded the franchise; the services operated by South Eastern Trains transferred to Southeastern on 1 April 2006. The franchise was let for an initial eight years, with a two-year option dependent on performance targets being met. The opening of the second phase of High Speed 1 in November 2007 made available train paths on the traditional network previously used by Eurostar, allowing Southeastern to increase certain services in December 2007. In December 2008, as part of the franchise agreement, responsibility for the Redhill to Tonbridge Line passed to Southern. Southeastern high-speed services began full operations on 14 December 2009. Having met the performance criteria, in March 2011 the DfT granted Govia a two-year franchise extension until March 2014. Following the DfT's review after the cancellation of the InterCity West Coast franchise process, extensions were granted to the franchises due for renewal with Southeastern's franchise extended until June 2018. It was later extended until December 2018. In March 2009 the bay platforms at London Blackfriars closed for reconstruction as part of the Thameslink Programme. Southeastern services previously terminating at Blackfriars, mostly from Sevenoaks via the Catford loop, were extended to Kentish Town, St Albans, Luton or Bedford. When the station fully reopened with new bay platforms in May 2012 these services continued to run, but in the evening and at weekend (when the station had been closed) instead of terminating at Victoria services now terminate at Blackfriars. Following the Department for Transport's review after the cancellation of the InterCity West Coast franchise process, extensions were granted to the franchises due for renewal in the near future. In 2013, the coalition government extended Southeastern's franchise, without competitive tender, from March 2014 to June 2018. and in 2016 further extended it until December 2018. The Invitation to Tender, detailing the improvements that must be made by the new franchisee, will be released in September 2017 and the contract will be awarded in August 2018. Amidst a background of ongoing rail strikes nationwide, in September 2017, Southeastern cleaning staff, outsourced to employment agency Wettons, voted to stage industrial action in a row over pay and working conditions. The first strike by RMT-affiliated Wettons cleaning staff at Southeastern took place for 24 hours from 2030–2030 on 19–20 October 2017. There has been no further industrial action since, although negotiations between the RMT, Southeastern and Wettons remain ongoing. As part of the 2018 Thameslink Programme several of the routes formerly operated by SouthEastern changed into Thameslink routes, including services to Sevenoaks and Gillingham. These services using the Class 700 now run from Bedford through the London Core via London Bridge and onto the Kent Mainline or the North Kent Line. In addition the former Charing Cross / Cannon Street services which started and terminated at Gillingham were extended to Rainham. Off-peak journey times from Kent towns to London using classic lines and High Speed 1 in October 2012. Southeastern introduced a full timetable of domestic high-speed services branded Southeastern Highspeed over High Speed 1 between London St Pancras and Ashford International on 13 December 2009; a limited preview service had been running since 29 June 2009. High-speed trains use High Speed 1 calling at Stratford International and Ebbsfleet International. 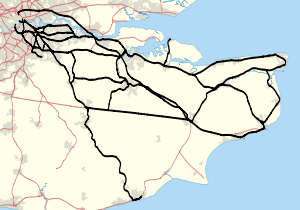 Trains from London to the Medway towns and Faversham leave the high-speed line at Ebbsfleet and continue via the North Kent line and Chatham Main Line. Trains for Dover Priory and Margate leave the high-speed line at Ashford International. A limited peak-hour service now also operates between St Pancras and Maidstone West via Ebbsfleet and Strood. When bidding for the franchise, Southeastern made a point of advertising part-owner SNCF's experience operating integrated high-speed train services on the French TGV network. A fleet of 29 six-coach Shinkansen-derived high-speed 'A-trains' were built in Japan by Hitachi for this route. Known as Class 395, this was Hitachi's first train sale in Britain. The colour scheme for the high-speed trains is dark blue. The services are marketed as Southeastern Highspeed, and some of the trains are named after British Olympians such as Steve Redgrave and Ben Ainslie. At the same time there was the largest change to the timetable in the area in 40 years. With the fast trains now travelling over High Speed 1, the Charing Cross to Ashford stopping service was extended to Dover, Canterbury and Ramsgate. Fares for journeys that include the High Speed 1 section of line (between St Pancras International and Gravesend) generally include a surcharge. "Olympic Javelin" redirects here. For the sport event, see Javelin throw at the Olympics. Southeastern operated special high speed services using the Class 395 during the 2012 Summer Olympics and Paralympics, branded as the Olympic Javelin or Javelin. As a result, the class is still sometimes referred to as the Javelin. Announced as part of the successful London 2012 Olympic bid, it was an integral part of a plan to improve public transport in London in readiness for the Olympics, an area of the bid that was initially regarded as being poor by the International Olympic Committee (IOC). The British Olympic Association applied to register Javelin as a UK trademark on 19 July 2005 and this was granted on 2 June 2006. The service ran for the duration of both games, between St Pancras International station and Ebbsfleet International station, via Stratford International station, which is close to the Olympic Park. Eight trains per hour ran between St Pancras and Ebbsfleet, calling at Stratford, replacing the usual East Kent highspeed service. Two of these were extended to Ashford and one to Faversham. Between 11pm and 1am the service between St Pancras and Ebbsfleet was increased to twelve per hour. At St Pancras there is interchange with the London Underground and with trains to/from the Midlands, Scotland, and the North of England. For track capacity reasons, Eurostar trains, which have never called at Stratford, did not do so during the games. [not in citation given] It was expected that over 80% of Olympic spectators would travel to and from the venues by rail. Services to the Olympic Park were planned to offer a total capacity of 240,000 travellers per hour, some 25,000 of whom were expected to use the Javelin service. Southeastern is the key operator for Kent, and also serves East Sussex. 'Mainline' services connect central London with Dover, Folkestone, Hastings, Royal Tunbridge Wells, Ramsgate, Chatham, Maidstone and Canterbury. The backbone fleet on these services is the Class 375 Electrostar, although Class 377 Electrostars and Class 465/9 Networkers are also used on some routes. In December 2009 Southeastern saw 'Highspeed' trains stopping at 'Mainline' stations, and some longer timings on 'Mainline' services as trains called at more stations. Services to Tonbridge were maintained at six trains per hour off-peak, two per hour going forward to Ashford and beyond, two per hour to Hastings, and two per hour terminating at Tunbridge Wells. With high-speed services reaching Faversham, the half-hourly Victoria to Faversham stopping service was replaced with an hourly service to Gillingham and additional stops on the "fast" services to London Victoria. On the Maidstone East Line, services from London Cannon Street to Ashford International via Maidstone East and from London Victoria to Maidstone East and to Canterbury West via Ashford were replaced by a half-hourly Victoria to Ashford service. The Strood to Paddock Wood service was extended to Tonbridge. The Sittingbourne to Sheerness on Sea Branch Line also comes under 'Mainline' services, but is mainly operated by Class 466 Networkers. Southeastern serves South-East London, South London and on into Kent, its central stations being London Blackfriars, London Bridge, Charing Cross, Cannon Street, London Victoria and Waterloo East. 'Metro' trains serve Greenwich, New Cross, Lewisham, Dartford, Gravesend, Woolwich Arsenal, Hayes, Peckham Rye, Bromley South, Bickley, Bexleyheath, Petts Wood, Orpington and Sevenoaks. Southeastern runs Class 376 Electrostar, Class 466 & Class 465 Networkers for 'Metro' services, although a Class 375 Electrostar is used on occasion. 2tph return to Cannon Street via Crayford and Sidcup and 2tph return to Cannon Street via Barnehurst and Bexleyheath. Service returns to Cannon Street via Slade Green and Woolwich. Oyster cards are now valid from all Zone 1–9 stations served by the company, indeed the travelcard zones were extended to include stations such as Dartford after initial outcry by passengers being required to travel to Zone 6 stations such as Slade Green, Barnehurst or Crayford to "tap in" before continuing on their journey. Travelcards (including on Oyster) are however not valid on High Speed services, except between St Pancras International and Stratford International albeit at a special pay-as-you-go fare. Figures released by NR (Network Rail) rate punctuality at 85% (Public Performance Measure) over period 12 of 2015/16, and 87.3% moving annual average (MAA) for the 12 months up to March 2016. In late 2010 the company faced a barrage of criticism for its performance during extreme weather conditions in the south-east of England and there are also allegations that Southeastern deliberately runs reduced services to skew its official performance figures. In 2014 a survey of UK rail passenger satisfaction showed Southeastern to be the lowest rated train operating company, with just forty percent of passengers believing that a good service is provided and a rating of only one out of five for value for money. Southeastern claimed that the reason for this is that people dislike going to work and that if the survey were to be retaken on a "sunny summer's day" the outcome would be better for the company. However, in a survey (Best and worst UK train companies) carried out in February 2015 by Which? magazine, Southeastern continued to rank poorly, being rated as the second worst UK train operating train companies, with a customer score of just 44%. This was narrowly ahead of Thameslink and Great Northern, with 43%. Southeastern also achieved only 2/5 or 3/5 star ratings across the six specific categories assessed in the survey (such categories included Punctuality, Reliability and Cleanliness of toilets). Southeastern performed poorly in performance and passenger satisfaction in 2016, with the 2016 survey by "Which?" magazine finding Southeastern to be the joint-worst performing train operating company in Britain, with a customer score of just 46%. The Spring 2016 National Rail Passenger Survey further underlined Southeastern's continuing poor performance and passenger satisfaction. The company issued a joint response with Network Rail on the day of publication, primarily blaming outside factors and survey methodology. Southeastern operates a fleet of about 392 trains, all of which are electric multiple units. 377501-8 cascaded permanently from Thameslink in December 2016. Rest of 377/5 Fleet cascaded over to Southeastern in September 2017 with 377163/4 also joining. The transfer of some routes to Southern and Thameslink allowed Southeastern to withdraw its small fleet of Class 508 EMUs and replace them with Networker stock cascaded from other services. In January 2016, Transport for London announced its intention to take over the London suburban parts of the franchise from 2018, integrating the routes into a proposed metro network. However, in December 2016, Transport Secretary Chris Grayling rejected Transport for London's plan to take over Southeastern suburban services from 2018. In June 2017 the Department for Transport announced an Abellio/East Japan Railway Company/Mitsui consortium, incumbent Govia, Stagecoach and Trenitalia had been shortlisted to bid for the next South Eastern franchise. On 10 August 2017, Trenitalia ceased interest in the franchise. Alstom joined Stagecoach's bid in February 2018. The Invitation to Tender for the next franchise was issued in November 2017. The winning bidder will take over the franchise on 23 June 2019. ^ "London & South Eastern Railway Limited". Companies House. Retrieved 29 December 2017. ^ Company information, Southeastern, 2010. ^ "New Southeastern managing director named". Rail News. 21 August 2014. Retrieved 6 January 2018. ^ "Additional services in December 2007 timetable" (Press release). Southeastern. 18 July 2007. Archived from the original on 28 September 2007. Retrieved 15 July 2008. ^ a b "High-speed travel for commuters". BBC News. 14 December 2009. Retrieved 14 December 2009. ^ "Train times 22 March – 16 May 2009 Thameslink route" (PDF). First Capital Connect. Archived from the original (PDF) on 19 April 2009. Retrieved 20 March 2009. ^ "New Train Timetable". Southeastern. 16 May 2012. Archived from the original on 10 September 2012. Retrieved 23 May 2012. ^ Barrow, Keith (26 March 2013). "British government issues revised franchising schedule". International Rail Journal. Retrieved 27 March 2013. ^ Ford, Coreena (6 December 2016). "Southeastern franchise extended until December 2018". Evening Chronicle. Newcastle/Tyne. Retrieved 6 December 2016. ^ "RMT TO BALLOT CLEANERS FOR ACTION ON SOUTHERN & SOUTHEASTERN". RMT. 31 August 2017. Retrieved 22 September 2018. ^ "CLEANERS' BALLOTS UNDERWAY ON SOUTHERN/GTR AND SOUTHEASTERN". RMT. 5 September 2017. Retrieved 22 September 2018. ^ "Cleaners on Southeastern railway to strike in pay row". ITV News. 2 October 2017. Retrieved 22 September 2018. ^ Price, Chris (2 October 2017). "Train cleaners for Southeastern to go on strike". KentOnline. Retrieved 22 September 2018. ^ "Highspeed services". Southeastern. Archived from the original on 20 May 2011. Retrieved 5 June 2010. ^ "Vision for Southeastern". Govia. Retrieved 17 September 2009. ^ "£250 Million Contract Signed for New High Speed Train Fleet for Kent" (Press release). Strategic Rail Authority. 1 June 2005. Archived from the original on 14 June 2006. ^ "Jamie Staff Unveils High Speed Train" (Press release). Southeastern. 21 September 2009. Archived from the original on 6 October 2009. ^ "First Class 395 'Javelin' named at Ashford International" (PDF). Railway Herald (195). Scunthorpe. 28 September 2009. p. 6. ^ "£20m bullet trains to serve Olympic Park" (Press release). Olympic Delivery Authority. 28 October 2004. Archived from the original on 4 April 2012. Retrieved 13 December 2008. ^ "Japanese bullet train on display". BBC News. 2 October 2007. Retrieved 13 December 2008. ^ "Our plans: Getting ready". Olympic Delivery Authority. Archived from the original on 5 December 2008. Retrieved 13 December 2008. ^ "Countdown to Kent high-speed commuter service begins" (PDF). Railway Herald. Scunthorpe. 14 December 2008. p. 4. Retrieved 29 December 2008. ^ Edwards, Tom (26 July 2011). "London 2012: Transport issues still to be resolved". BBC News. Retrieved 6 January 2018. ^ "Case details for Trade Mark 2397248". Intellectual Property Office. Retrieved 13 December 2008. ^ a b Transport Plan for the London 2012 Olympic and Paralympic Games – first edition (PDF). Olympic Delivery Authority. p. 64. Archived from the original (PDF) on 23 October 2008. Retrieved 13 December 2008. ^ Southeastern. "Olympics timetable High Speed". Archived from the original on 12 February 2012. Retrieved 4 April 2012. ^ "Mainline services". Southeastern. Retrieved 5 June 2010. ^ "Metro services". Southeastern. Retrieved 5 June 2010. ^ "January 2015 timetable summary". SouthEastern. Archived from the original on 24 December 2014. Retrieved 16 February 2015. ^ "Rail performance results period 13". Network Rail. ^ "Southeastern responds to snow criticism". News Shopper. Petts Wood, Kent. 20 December 2010. ^ Millward, David (31 December 2010). "Rail passenger anger over Southeastern Trains delay compensation". The Daily Telegraph. London. ^ "Southeastern: Why are we worst train company? Because you hate going to the office". Metro. London. 17 February 2014. ^ "Train guides and advice". Which?. n.d.
^ "Southeastern and Thameslink 'worst' in rail satisfaction survey". BBC News. 18 February 2016. ^ "National Rail Passenger Survey Spring Report" (PDF). Transport Focus. June 2016. ^ "NRPS results" (Press release). Southeastern. 30 June 2016. ^ "Train operating company driver's depots on the Traindriver.org website". September 2017. ^ "TfL to control all London commuter services and new metro network". Rail Technology Magazine. 21 January 2016. Retrieved 22 September 2018. ^ Gillett, Francesca (7 December 2016). "Sadiq Khan hits back after government blocks plan for TfL to take over suburban rail services". Evening Standard. London. Retrieved 22 September 2018. ^ "West Coast Partnership and South Eastern rail franchise bidders". GOV.UK. 22 June 2017. Retrieved 22 September 2018. ^ "South Eastern franchise bidders announced". Railway Gazette. 22 June 2017. Retrieved 22 September 2018. ^ "Trenitalia backs out of South Eastern contest". Railnews. 10 August 2017. Retrieved 22 September 2018. ^ "Alstom to join South Eastern franchise bidding". Railway Gazette. 6 February 2018. Retrieved 10 March 2018. ^ "Major shake-up for Southeastern rail". Hastings & St Leonards Observer. 1 December 2017. Retrieved 10 March 2018. ^ Gill, Oliver (28 July 2018). "Doubts over rail franchise bidders delay the timetable". The Telegraph. London. Retrieved 22 September 2018. This page was last edited on 22 April 2019, at 07:50 (UTC).